Growing up 99% of children watch at least one Disney movie. Okay, I am making that statistic up, but needless to say most kids have seen at least one Disney movie. Snow White, Mulan, Sleeping Beauty, Beauty and the Beast, Little Mermaid, Aladdin, Hercules, Princess and the Frog... the list goes on. And what do they all have in common? Many of Disney's movies are based on other writings, often much darker, like the Ogre that is the Prince's mother in the tale of Sleeping Beatuy who's daughters name is L'Arore. They have often prettied up the story, changing it to fit their mold. From a historical standpoint Pocahontas is atrocious. First, that isn't even her original name. When she met John Smith she was about 10 years old. They never married. She married a dude named John Rolfe when she was 19. So what are we learning from disney? 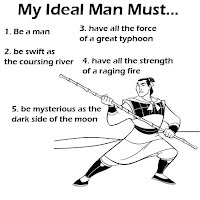 Well apparently we are to marry the perfect man. He is strong, smart, brave, he is wealthy and handsome. He can dance, fight off evil dragons, captain a ship, and give a kiss that makes time seemingly stand still. He can sing. AND he just happens to be a prince. I found this online and couldn't help but laugh. 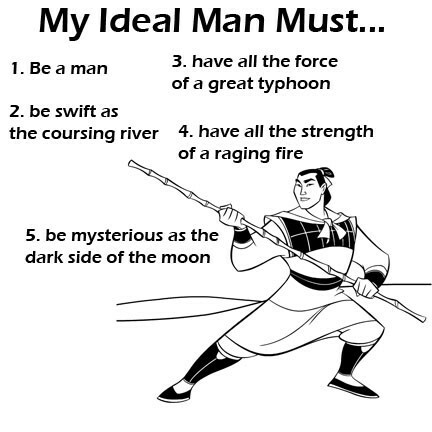 And you know you have the song in your head now (provided you have seen Mulan). We are also learning that animals are our best friends. They can dance with us, sing with us and make us a dress for pete's sake. I mean. Who needs real friends when you can have tons of creepy mice that talk and wear clothes be with you all day. Not to mention if you wander around in the woods you might stumble onto a cute cottage with 7 little men with ridiculous names and horrendous cleaning skills that can take you in. Now don't get me wrong. I love my Disney just as much as the next girl. But has Disney put unrealistic expectations in the minds of little girls? Unless you have a mental health issue or are Dr. Doolittle I highly doubt a talking animal will be your friend. Is it even possible to find a good-looking, dancing, singing, strong, enemy-fighting man that believes what you do and has the same hopes for the future? Every girls is looking for that happy ever after. That perfect man. Because thats what we think is out there for us. But is it really? Is there a Prince Perfect? I am a firm believer that somewhere out there, there has to be a Prince Perfect-For-Me. A girl's gotta have hope right? Fun fact: I am 22 and have never dated. Never had a boyfriend. Never been on a date. I'm not saying this to get sympathy I am simply saying this because it's tough out there for a Christian girl with traditional values to find that 'perfect' person. But I have to believe that there is a bigger plan at work. I stumbled across this quote from the women who make up the Christian group Barlow Girl: "We believe that God has one perfect man already chosen for us; therefore we have no need to worry ourselves in searching for him. When the time is right, we know God will bring us together. In the mean time, we are not hiding in a closet avoiding all males, we are still living our lives, just without the pressure of having to have a boyfriend." So back to the quotes on my last post. We are all Cinderella. We all have an inner beauty and must go out and find our happiness. (Something that I have yet to put into action). While perhaps a happily forever after doesn't exist, what about the now? What about taking pictures of happy moments to make sure they are ever after? It's hard to let go of that fairy tale. We all want a happy ending with our own prince or princess. So while Disney may give us unrealistic expectations, maybe those very expectations are actually Disney's way of giving us a gift. A way to keep the kid inside of us alive. That childlike wish, hope, faith, that someday our Prince (or Princess) will come. That we will get our happily ever after before the credits roll and the storybook closes. Side note: I used to work at a video rental store and had a dad tell me he would not allow his children to watch Disney movies. "Why?" I asked. His response was that almost all Disney movies portray one of the parents dying, as already dead, or as absent. Have you ever noticed that? Cinderella, Snow White, Aladdin, Little Mermaid, 101 Dalmations, Pocahontas... crazy, right!? Now that you mention that, yes thats true about Disney movies.. This is such a great post! And it's funny too! Haa...haa, Heather. I never even thought about this angle of Disney movies being harmful. Good one! About these movies having a parent missing, my daughter asked me right after she watched "Finding Nemo" (she was four), "Why does the mom always die? Is that how it will be in real life, too?" :-(. Gave me pause, let me tell you! You're right Hema, sometimes you do just need a feel good movie. I am glad you guys liked this one!